A- I have to agree with another reviewer here and say that this looks like piss...but I'll add that it looks like the color of urine if you are dehydrated! There is a very fizzy white cap of froth to start but it quickly fizzles to nothing. There is an absolute ton of carbonation with probably some of the largest bubbles that I've ever seen in a beer rising to the top. There is no lacing to speak of either...it just clings then fizzles out. Typical buck a beer look! S- It smells of dry grasses and sweet corn malts primarily. The finish is actually slightly hopped and bitter smellin, but it doesn't resemble what a Pilsener is at all really....nothing noble about these hops! T- More of the same here, with sweet malt, albeit primarily of bland corny tastes and some dry grassy flavor. The finish, well lets just say that the aroma is a little misleading....there is a bit of bitterness, but its almost a metallic flavor rather than the leafy type that I was hoping for. D- I've had better obviously, but there's a few stinkers that this beats out for sure! For the price, yeah it does the job and makes a decent company beer. I may buy this again when cash-strapped but will probably look for something else first. After two or three of these, I can definitely see myself tiring of the cloying corn sweetness. Pale yellow appearance with head that disappears quickly. Smell is sweet and grainy. Taste for the most part is sweet, malty and grainy. Picked up a bit of grass and hops. Light bodied with moderate carbonation. Aftertaste is bitter and very acidic. Overall, this beer is simple and inoffensive beer. Nothing to impressive but good for chugging down on a budget. Worth checking out in terms of cheap beers. 355ml can poured in a dimpled mug. Straw yellow and clear. Solid white head is 1 inch at the pour and settles nicely to a thin 1/8" cap. Sporadic sheets of lacing. Aroma is slightly sweet, but mostly grainy with adjunct (corn?) backgrounds. Taste is mostly grains throughout with a bit of an acidic bite at the finish. A sweetness develops popping in here and there in different sips, but not with each one. Actually loses a bit of the acidity and gains sweetness as it warms, improving the flavour, up to a point. Mouthfeel is light-medium bodied with a moderate amount of carbonation. Atleast it's not overly carbonated like alot of macro lagers. Described on their website as a pilsener style lager, this really doesn't display any pilsener characteristics, but is infact an average macro lager. Nothing special, but nothing really wrong with this one, but if you have a choice, grab the Premium Lager or Premium Pilsner instead. One thing I can honestly say about this beer is that it seems to improve as you go through the glass. I had 2 the night I picked up this 6-pack and at the first sips of the first beer I thought I was in trouble. By the time I was half way through the second (about an hour later) I was rather enjoying it. Strange but true. Can't beat the price on this stuff; not without getting into some seriously bad tiers of beer, anyway. Pours a pale golden-orange colour with a puffy, one-finger head. Decent head retention and body for the style; it settles to a creamy white cap over the next few minutes. Smell is another story; corn syrup dominates with some underlying malt sweetness and ethanol. Taste is classic adjunct lager - sweet corn and cooked vegetables, with underlying hints of barley malt and hops. The finish is slightly dry, which is a nice touch, and shows that they are at least trying, but for the most part adjunct is the dominant flavour. This beer will never win any awards, but it's highly drinkable. Watery mouthfeel with thin to medium-thin body. Carbonation is only moderately high. This is obviously not a real pilsener, but grading it as an adjunct lager, it is above average. If you combine this with the fact that it is Dirt Cheap with only a few marginal brands beating it in this category (while coming nowhere near it in terms of tastiness or drinkability), Brewhouse is a surprisingly passable option. Don't get me wrong - it's an adjunct lager, and the flavor is nothing to get excited about. But if you just want to throw back beers for social purposes, Brewhouse is very high quality for the price. Like all beers of its style, drink this ice cold for best results. lot's of slogan's associated with this brew..free hangover in everycase..and the like. Certainly looks and acts like a cheap macro...quite pale in color, poor head retention that ended up a small white ring. Grainy and a husky grain at that, some sweetness that may or may not be corn, but at least no cooked veggies, sludge, etc. For a cheap, near the bottom price-wise...it ain't half bad. A bit of a adjuct like blast right @ the start..but it's quick and then gone, replaced by a sweet maltiness. Very lightly hopped, if @ all on some sips. A bit tinny on the late, late aftertaste. Mouthfeel is on par with other average macro's...lighter in body than some of the better one's, but overall not unpleasurable. Beats the snot out of every contender I can think of in it's price category. 355ml can. Round two of my day-after-Boxing-day singles bin tour of one of my hometown liquor stores. This beer pours a clear medium golden straw colour, with two flabby fingers of puffy, densely foamy off-white head, which leaves a bit of random islet lace around the glass as it hardly takes its time falling away. It smells of gritty, grainy corn and barley-influenced pale malt, a bit of dead grass, and some further weedy astringency. The taste is fairly sweet, but not overly so pale malt and corn-heavy grain, and a mildly off-putting skunky edge, while the previously identifiable hops are now missing and assumed neglected. The carbonation is average for the most part, maybe a tad frothy here and there, the body an adequate medium weight for the style, and just a tad clammy in its workaday smoothness. It finishes off-dry, some semi-sweet corny grain and weedy sass lingering. Overall, not bad for the price, but hardly good for the soul. Nothing overtly amiss with this one, especially given its shelf-side drinking peers. Worthy of post hockey game pounding, or fishing and camping trips alike, where compromise is the name of the game. Brewhouse! a beer my buddy brings over before we go play shinny on the outdoor rink... and it's fantastic tasting after hard skating for a couple hours! A: not super impressed, light pale yellow with a very thing head that vanishes almost straight away into nothing more than a bit of white. S: distinctive grain smell, no skunk, a bit sweet. T: it's a sweeter tasting beer with a minor ammount of hops. it's pretty decent for being cheap. a neat side note on Brewhouse is it tastes pretty much the same at all temperatures ranging from room temp to nearly frozen! M: thin, with medium carbonation, doesn't stick around long. D: quite, because of it's inoffensive smells/tastes and lack of huge carbonation found in other cheap beers this one's pretty good. this beer is best enjoyed doing something, like softball or scrub/pug sports and not focusing on 'rating' it. it's cheapness makes it a good pick for budget/party drinkers. To best cool this beer we just jam them into a snowbank and they're pretty much good to go in 4-5 minutes... in the summer at the lake, just toss them into the water. average beer for well below average price. pick up a case between paydays if you want a cheap night. 355ml can poured into a 16oz pint glass. A - Head probably would have hit two-and-a-half fingers in a bigger glass. Typical adjunct lager appearance, with a golden-yellow apple juice like hue to it, with maybe a bit of darkness to it. The head settles to a nice cap, and even leaves some spotting lacing on the way down. S - Surprisingly well balanced mixture of sweet, grassy hops and a nice malty backbone. Color me shocked, this ain't half bad. T - A rather tasty and mild bitterness throughout this one. Light graininess and a touch of sweet malt to it, and a slightly dry hint of hops in the finish. Although it is still a bit bland and watery, it isn't half bad. M - Pretty thin. Decent carbonation. About average for the style. D - For the price, it's pretty unoffensive, and it's really not too bad. Taking into account the price of it really makes it a good buy. Despite this, I don't see myself revisiting this one in the near future. It's alright, but nothing special. For a budget beer it’s pretty good. It had a head made to dissolve into nothingness. No lace. It actually comes with some flavour at a budget price. It has topside malt sweetness mixed with some lingering bitterness. It has hop and only a light wateriness, better than most budget offerings. I have had what this brewer considers top flight and this will do nicely to put me over the top, after the expensive beer tastings are over. This beer is great value! Looks like ... urine. Really pale yellow. Like Corona light or something. Taste is nice and malty with quite a bit of sweetness. A little hops. Nothing great. A: Pours a faint clear golden with a small white soapy head that is gone instantly but leaves a faint ring. S: A sweet grainy aroma. T: A sweet grainy taste just as the aroma advertised. M: Light body with light-medium carbonation very soft. D: Not a bad macro if you're going for quantity and not taste. It's also one of the cheapest beers you can find. 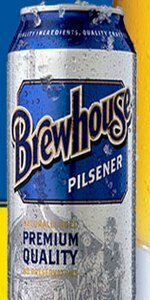 Brewhouse is a favourite big brew in Western Canada - just a small step below the big boys. I will give them credit - they sell a very cheap adjunct lager that doesn't taste as bad as the same ones in it's class. The beer is your typical pale yellow with a great deal of carbonation - standard stuff. The taste is clean. There is a bit of subtle corniness in it, but it is not overly sweet like most of the other cheap stuff here. It legit tastes like something Molson would have made, which is not a bad thing considering how cheap this stuff is (almost a buck a beer in some places - occasionally 20 bucks for a two four on sale)! The aftertaste is a bit metallic at times, but is generally not a huge problem. Overall, as far as cheap Canadian adjunct lagers go, this is one you might want to give a shot. 355ml can poured into tulip. Pours a clear pale yellow with one and a half fingers of fizzy white head that leaves absolutely no lace as it recedes. The head was gone by the time I got upstairs. Smells of sweet corn, grainy pale malt and old grass clippings. Tastes of more corny grain and very faint hops. Feels light and fizzy. Light bodied with acceptable carbonation. Finishes not quite dry. Verdict: Not recommended, but not as bad as I thought it would be. Make sure you drink it cold.